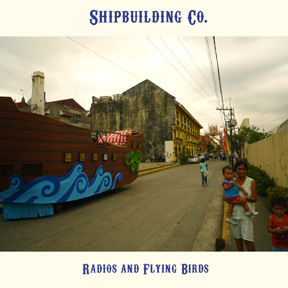 Shipbuilding Co. is the solo work of musician Michael Partington. Michael was a guitarist, vocalist, and songwriter in the critically acclaimed band, Head of Femur. In 2008 left behind everything he owned and moved to Taiwan, where he lived in a two bedroom apartment in a small Taiwanese alley, befriending the locals and trying all of the local delicacies. He quickly began recording his debut record, Radios and Flying Birds. Armed with only a guitar, keyboard, microphone, and laptop, Michael wanted to create the most organic and full sounding record possible using these four items. Hours were spent trying to create the sound of a band, manually playing every note by himself. Lyrics were written with the help of his wife, Maggie Pedersen, and the final notes were recorded while trapped inside during the devastating Typhoon Morakot. Having no outside influence, or even anyone he could speak English with, Michael settled on 13 songs from the many written for the record. He wrote about many topics such as: moving to Asia (Shanghai Maglev Train), alien visitation predictions (Made out of Diamonds), and the unexplained 1908 explosion in Siberia (You Tunguskaed my Heart). The songs are influenced greatly by the time spent traveling throughout Asia. The result is an eclectic, unusual album that will finally see the light of day in February 2011. The duo returned to the United States with open arms, and are currently residing in Nebraska, where Shipbuilding Co. has grown from a solo project to a full live band. Click links in tracklist to hear mp3s from this release.